Present Value of annuity calculation is one of the important factors to be taken into consideration when selling annuities. It helps you understand the value of your annuity and structured settlement payout. It lies at the basis of assessing the current worth of your future payments and is what determines, along with the Effective Rate applied to you by the buyer, the price that you'll get for selling structured settlement and annuity payments. Based on the discounting values, you can determine whether you are getting a fair deal by the annuity buyout company. What Is Present Value Anyway? Present value is an important, but complex method employed much in finance and economics. It is based on the Time Value of Money. 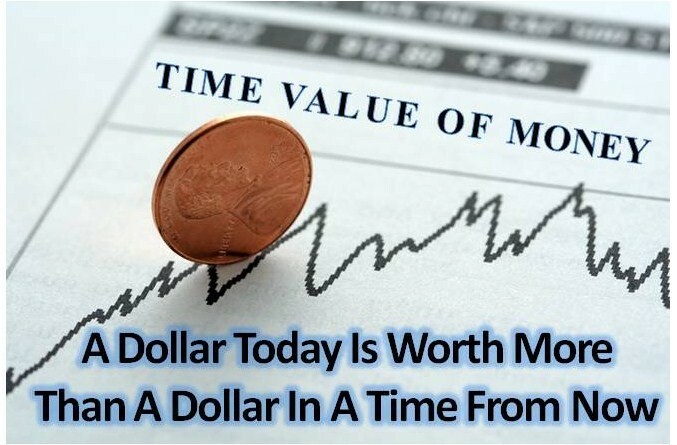 In plain English, it means that any given amount of money has more value today than it will have in years from now. Why is the value of money decreasing? It is because of increasing inflation, as well as because of the fact that you can invest the money today to accumulate interest and grow in its value in a time from now. Inflation has a significant effect on the value of money. Because the price of consumer goods will be higher in a time from now, you will need a larger amount of money to buy the same goods in some years from now. Well, But What Does It All Have To Do With My Annuity? Present Value has a direct impact on the buyout of your annuity. Because you will be getting payments from your structured settlements and annuities in years to come, the payouts will have LESS VALUE in years from now by the time you will be receiving them. It means, that you will have to use more money from your payments to buy your goods in a few years from now than you would be using to buy it today. For this reason, you will not be paid for selling your annuities the same amount as the periodic payments that you would get from the annuity company over the years. Because if you would get the same amount from the buyout company, you would in fact be getting more value than what your are selling. Example: let's say you are selling 10 years worth of monthly payments in the amount of $2,500 each payment - a total of $30,000. If you would sell your annuity payments for $30,000, you would get a lot more than the present value of annuity payments of your contract, because $30,000 today is a lot more value than the same amount in 5 or 10 years from now. No one would ever buy it from you for this price. Moreover: there can't be a reason fro anyone to pay you $30,000 now in order to get the same amount in installments over many years. Thus, you will get less than the sum of your annuity payments that you want to sell. By the way, for an excellent introductory treatment of the concepts of Future Value and Present Value of Annuity Payments and how to calculate them, you may want to check this out. 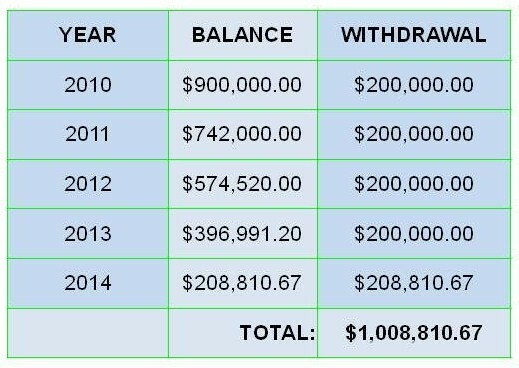 The table illustrates a hypothetical deferred annuity payments plan at an annual rate of 0.06 percent. In year 2021, the annuity will have a Future Value of $56,948.96. However, discounting it back to today, its Present Value is $30,000.00. Note: this table does not show the Distribution period of the annuity. Nor does it consider Monthly compounding, as it aims primarily to demonstrate the concept of Present Value. How much would you get? You should get, simply, the present value of annuity payments in the future. What Present Value of Annuity Means To You: you will get LESS for selling your annuity than you would get from annuity payments. Of course, all the factors have to be taken into account when calculating the fair buyout price for your annuity. It much depends on the type of your annuity payments, immediate, deferred, guaranteed or life-contingent, fixed or varied, basic or advanced - each factor has an effect on the present value of your annuity. It is important to understand that an annuity plan in the Distribution (payout) phase has a HIGHER present value than an annuity in the Accumulation phase (when you do the investments or it just keeps earning interest without payouts yet), as the former has Negative Cash Flow that is incorporated in the Discounting calculation to get the final Net Present Value. The Discount Rate as well is a very critical factor. Your Present Value will be dramatically different based on various discounting methods. As a rule, the higher the Discount Rate, the less will be your Present Value. If all this sounds too complicated to you, don't worry. I'm here to help you. You do not have to enroll now in an economics course in order to understand thoroughly the concept of present and future value and the Time Value of Money. The amount that your are giving up when selling the annuity for a lump sum is the DIFFERENCE between the sum of the future annuity payments and the lump sum cash out. There are also some fees involved in the selling process, as will be point out to you clearly. Again, no reason to panic if you do not understand all the technical stuff right now. I'll explain it all to you in simple terms. Know your rights. Find out the present value of your annuities and make sure you get a fair deal. ALWAYS ensure you're dealing with an honest and trusted party who is acting in your best interest and is ready to explain the process to you. Call me now to get a fair deal and full explanation. You'll get, first and foremost, friendly service, a fair deal and full explanation in plain English. No Giberrish, no hidden fees. What Do You Think About Present Value and Discount Rate?